Jan 26th Randy Gibbs got two striped marlin on the fly today! Way to go Amigo!!! The striped marlin fishing is super right now. Its a perfect time to catch striped marlin on the fly or spin gear. The inshore fishign is also really good and we are catching roosterfish, jacks cravelle, sore mackerel and even some cubera snappers. David Shaw It’s sushi time! I wanted to say thanks. My son and I had a great time fishing with your guys. They did an outstanding job. 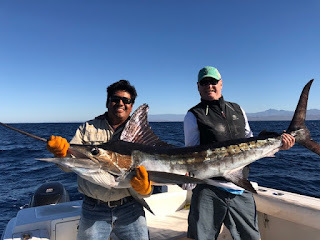 We caught more fish than I could have hoped for, including some nice Dorado which were extremely fun on the light tackle. Love those Roosters and we also got a bonus Jack Cravalle.